This is a question that nearly every investor regardless of whether they are investing in gold, silver, other commodities, or the stock market are asking. Many economists have predicted from the beginning of the year that we would at least see one more round of QE if not more. If that’s not confusing communication I don’t know what is. The latest comment from the Fed is positive towards precious metals. Two major movers in the investment community came out this week stating they believe more QE is on the way and it will be here soon. First, Goldman Sach’s Jan Hatzius came out and said that more QE(at least $500-$750 Billion) will be forthcoming as early as next month or no later than June. The stated reason for their belief was “The improvement might not last.” In other words, unless the “economic improvement” is guaranteed in perpetuity, the Fed will always ease.” Goldman Sach’s has influencial people working at both the Federal Reserve and also at the US Treasury and have a better outlook than potentially any other mainstream financial institution on QE. Also Pimpco’s Bill Gross came out and stated in an interview question about QE that “I think there has to be Dan. I believe there will be a QE3 and perhaps a QE3 and QE4.” Pimpco currently manages the largest bond fund in the world and Bill Gross has made good decision after good decision when it comes to market timing over the years. There is one final reason that suggests that QE3 is likely to come sooner rather than later. This year is an election year and the powers that be have a very strong incentive to keep things stable for the time being. 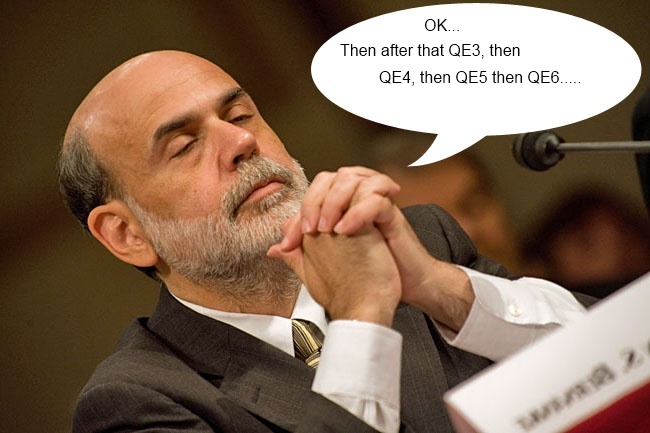 The only way they have historically been able to do that is through QE. Therefore it is imperative that they inject QE3 soon in order to allow its affects to rivet through the market so they can get the full benefit in the 2012 elections. However QE is like a drug. Each time the United States takes it, it takes more and more QE to have the same effect. Eventually the US will overdose.